Coffee really is “my cup of tea”. But, being married to a Brit has taught me to appreciate tea, too. In fact, in our home, the kettle is put on dozens of times a day, and cups of tea are constantly on offer. Bad day at work, dear – never mind, have a cuppa, the universal remedy. 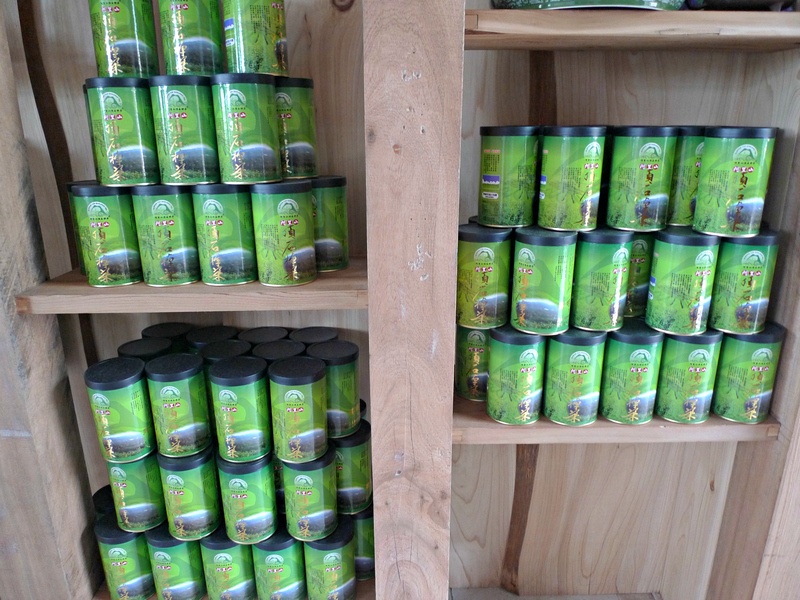 In recent years, we have moved more and more into Chinese green teas, and latterly Taiwanese Oolong since our daughter moved there two years ago. No mugs of sweet, milky Indian black teas in our household! 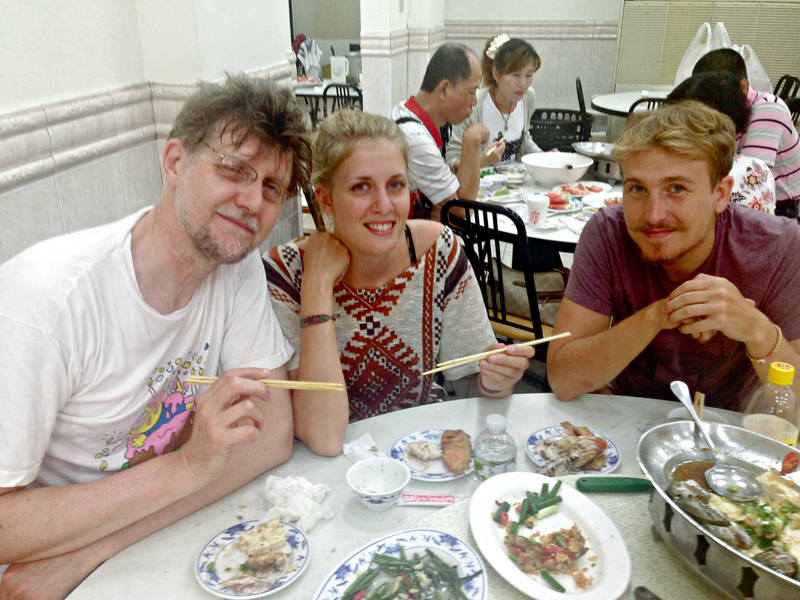 Last summer we had the wonderful chance of visiting our daughter in Taiwan for two weeks. 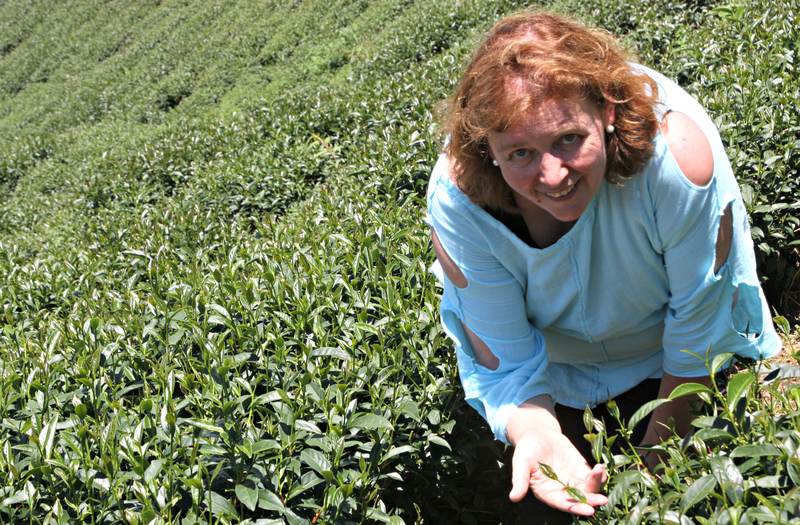 One of the musts was a visit to a tea plantation on the mountains as I’d always dreamed of seeing how tea grows. 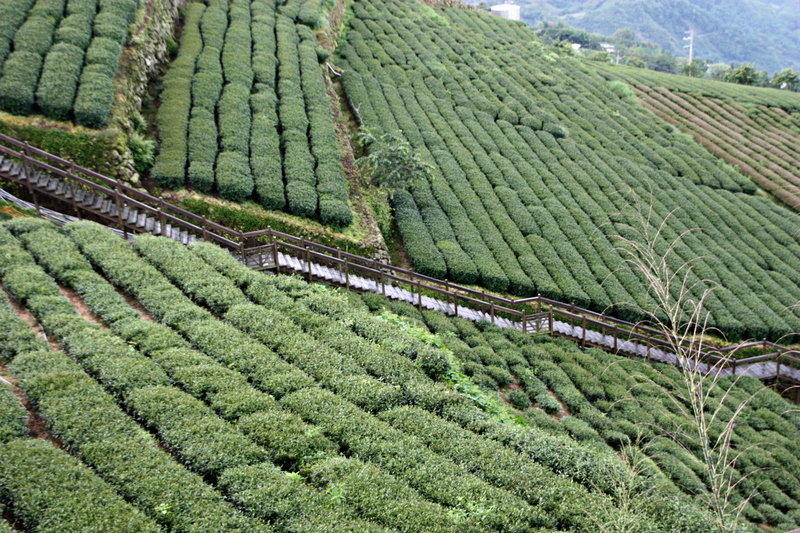 Taiwan is renowned for its teas – black, Oolong and green. 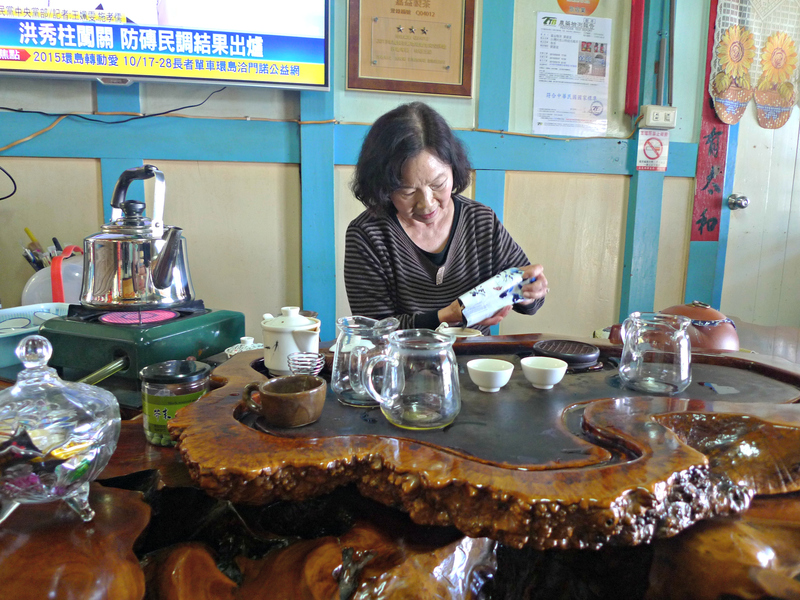 Apparently, the conditions in Taiwan are ideal (temperature, humidity, altitude), which makes Taiwanese teas highly sought after by real tea connoisseurs. Quite the journey it was. 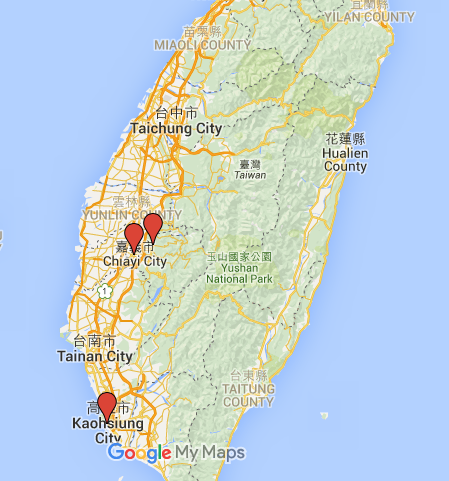 Starting off from the southern city of Kaohsiung, we (that is four of us: I, hubby, daughter and boyfriend) first took the train to Chiayi city, from where we continued by bus up the Alishan mountain (literally Ali mountain – ‘shan’ meaning mountain in Chinese). Little did we expect how high the mountain really was, and we didn’t even reach the highest point of it! Our destination was only at an elevation of some 1,400 m, while the highest peak would have been over 2,000 m. Once we started the ascent, it felt almost like being on an aeroplane taking off. With totally blocked ears, we oohed and aahed the scenery and, higher up, spotted the first small tea plantations on the slopes. How delightful! At times I had to close my eyes out of fear, though, when the steep mountain sides seemed far too close on the twisty and turny roads. More and more mist appeared, the higher we got, and the air got cooler and cooler, which was actually quite nice, after struggling with the humid heat of June on lower ground. We had booked our B&B accommodation through booking.com, and the owners kindly offered to pick us up at a certain bus stop. Waiting for our ride, in the middle of the late afternoon mist, we were lucky to have a pick-up truck stop by, with tea picking ladies with their signature bamboo hats and special bamboo baskets, happily travelling on the open back. I’d read about the physically hard and meticulous job of these ladies, carefully hand picking each tea leaf, to ensure premium quality. It was a pity that the best picking season wasn’t until a month after our visit, so I didn’t manage to see any of these ladies in action. Soon enough, the son of our B&B owner arrived to get us, but wanted to take us to Fenchichu Old Street for dinner first because he said they didn’t have any provisions for evening meals at their place. At first we felt a little disappointed as we were quite ready to settle in for the night but the evening turned out quite good in the end. Lovely little village style setting on the slopes of the mountain, but also quite crowded and touristy. 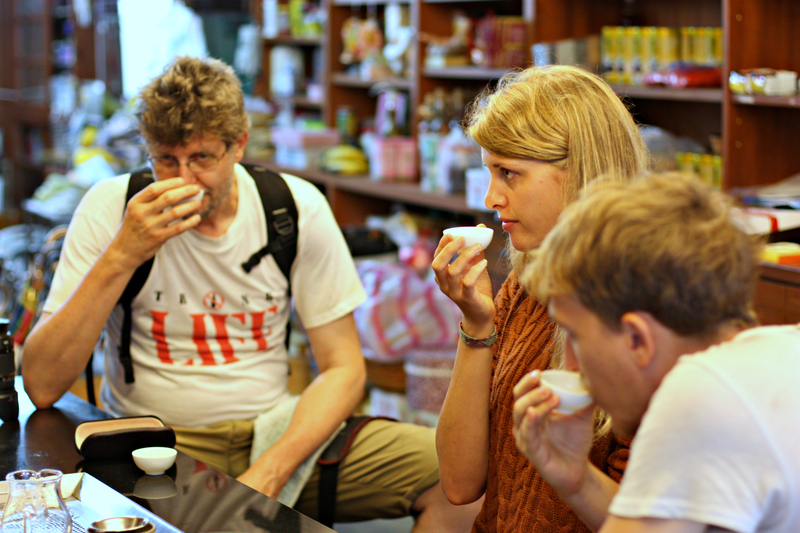 Strolling around the little streets and alleys, we found a nice-looking little tea shop that also offered tasting. In we went, of course! 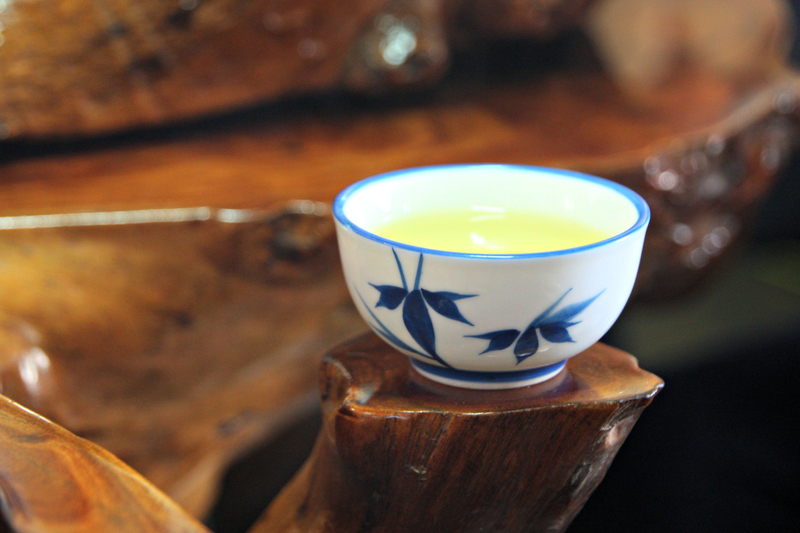 Our first taste of the genuine Alishan high mountain Oolong. Surprisingly mild, beautifully yellow in colour, and somehow curiously reminding me of the taste and faint smell of raw peas. Very smooth, with no hint of the slight bitterness of many green teas. In the traditional fashion, it was served from teeny, tiny cups, and the lady serving had quite an arsenal of little implements in front of her, to prepare the brew. 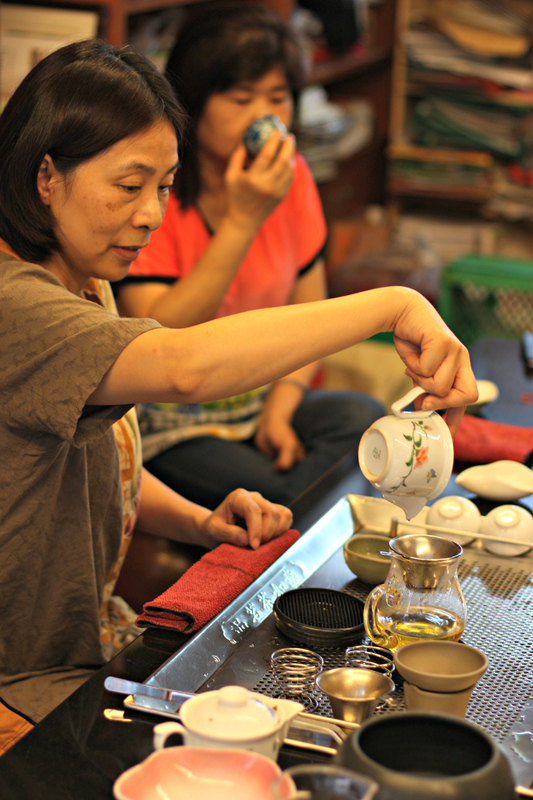 The atmosphere was relaxed and informal, nothing like the rigid and ritualistic tea ceremonies in Japan, for example. The hostess kept filling the kettle again and again, and pouring us more and more of the tea. It really was good, and we left with a few packets of it in our bags. For dinner, we tried the local speciality, ‘lunchbox’. In the old days, when Fenchichu was an important half-way refuel stop along the Alishan Forest Railway, somebody came up with the idea of selling train travellers a quick lunch in a box (made of wood, bamboo or iron) that was considerably lighter and easier to carry to the train platform than the previous noodle bowls. 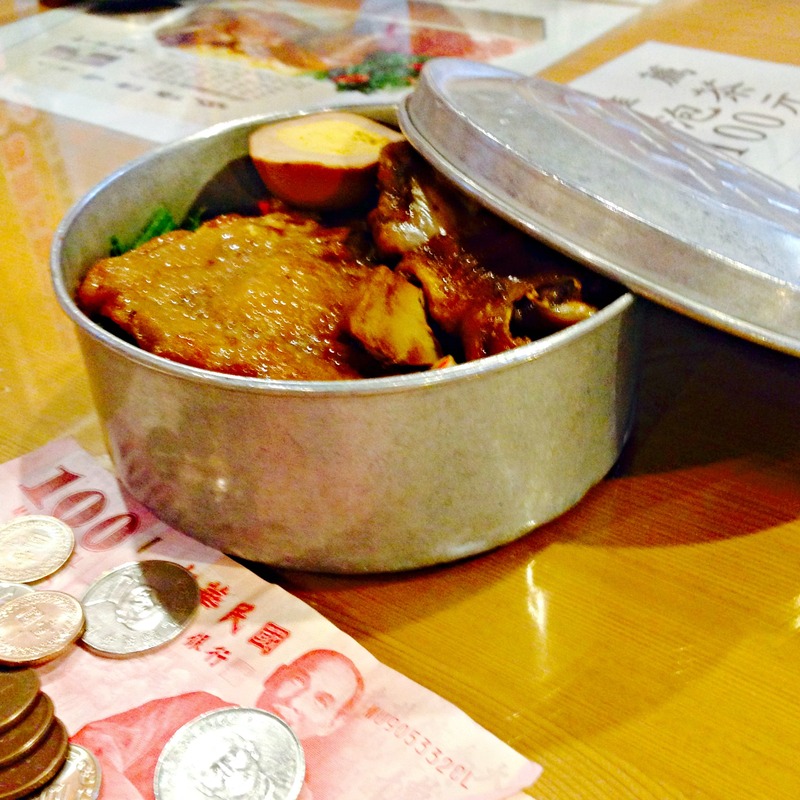 The lunchbox tradition is still kept alive in some restaurants. The food itself was not exactly to our liking – rice with some vegetables, a piece of chicken leg and chewy pork – but it was very cheap. 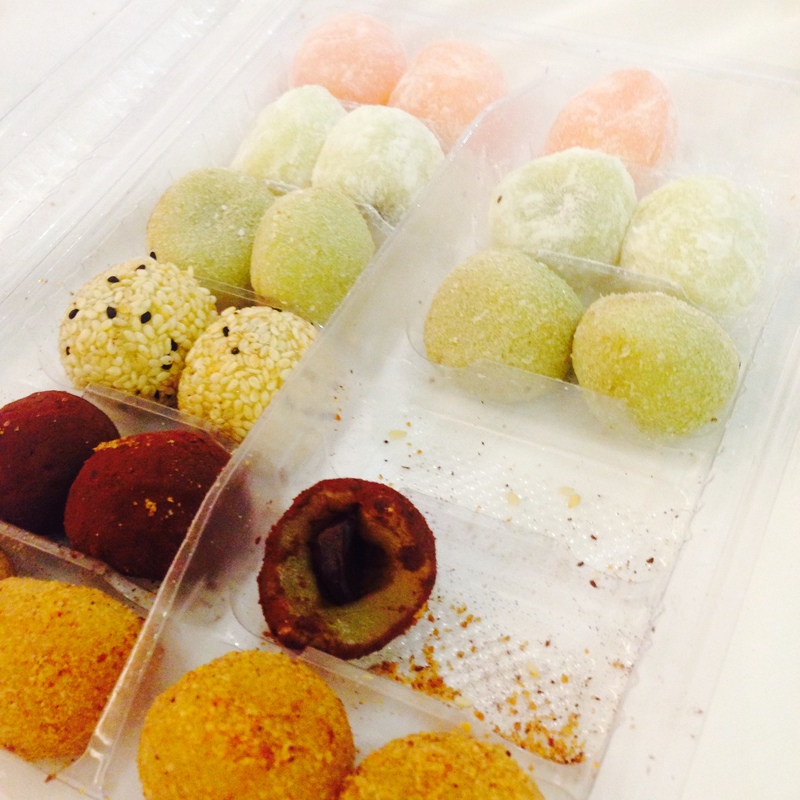 To wash down the rather greasy taste of the dinner, I just had to buy a selection of Taiwanese mochi. 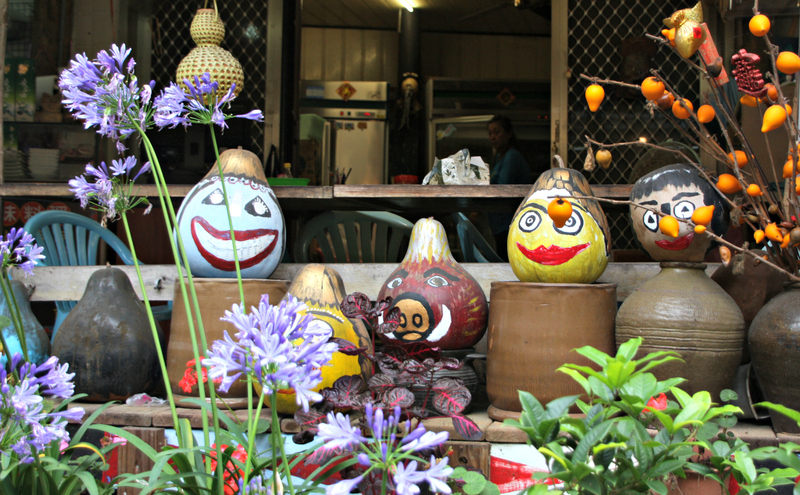 They are sticky rice paste balls with different fillings, such as peanut butter, black bean paste, or various fruit pastes. I adore the consistency and taste – one of my all-time favourite Asian desserts! 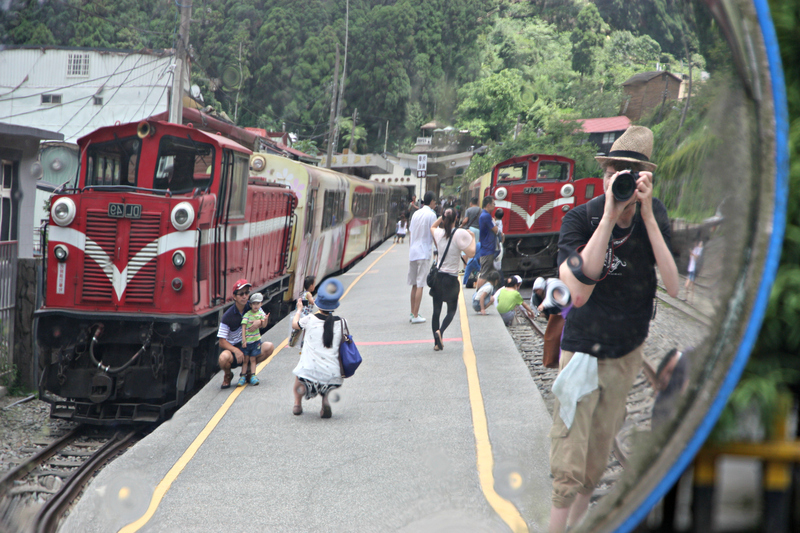 It was a nice surprise for us that Fenchichu is actually one of the stops of the famous Alishan Forest Railway. We were really happy to get return tickets on it for the next day – something we had wanted to do anyway! Finally, at the end of the day, we were driven to our B&B in complete darkness through almost impenetrable fog. We had no idea where we’d arrived as visibility was almost zero. Luckily we weren’t the drivers on the tiny mountain roads! 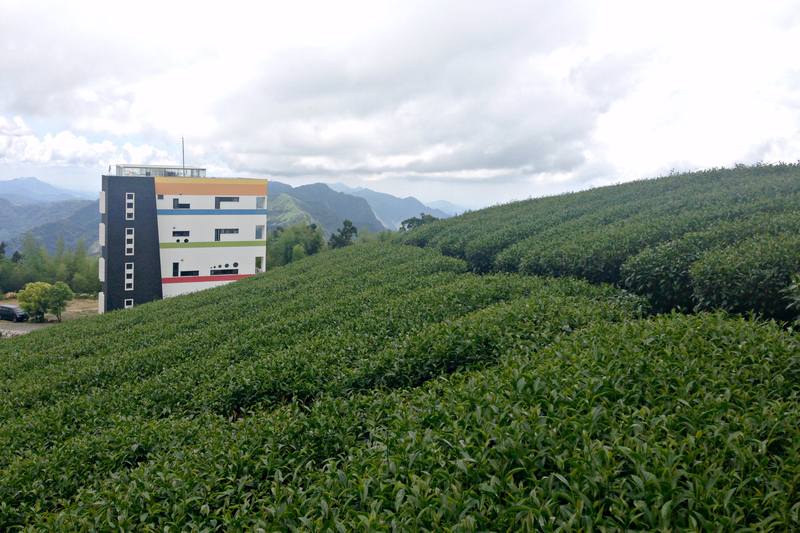 We had chosen our inn based on the fact that it had its own tea plantation. As we only had very limited time, staying on Alishan only for one night, we had to make sure that we’d at least see one plantation. After all, that was the main reason of our visit in the area. We all stayed in one huge room, which was lovely, and tastefully furnished, with big windows in two directions, a spacious bathroom and a balcony, too. Everything in the inn was perfectly tidy and clean. Late at night, with the fog and darkness, we couldn’t see a thing outside. We were hoping to catch the rising sun early in the morning, though, and set our alarms, keeping our fingers crossed for the fog to disappear by then. 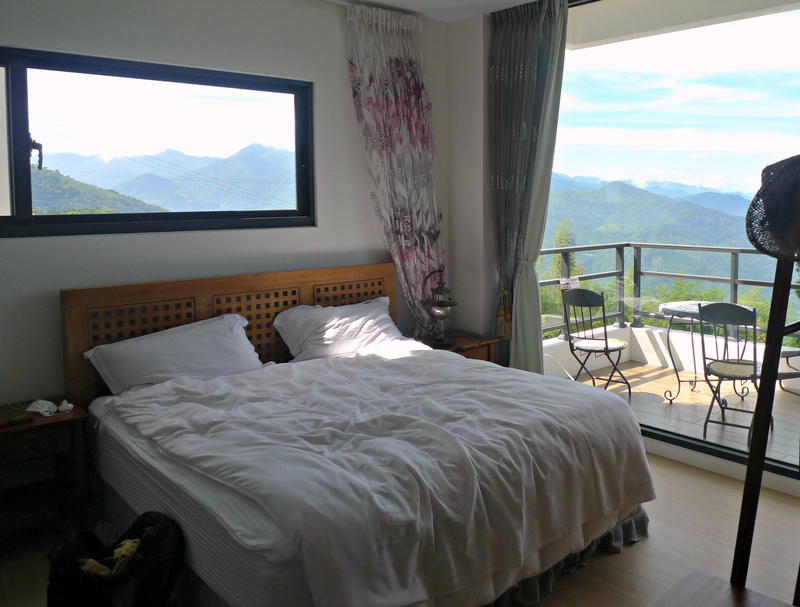 Most Alishan visitors travel to a special spot, either by car or the Forest Railway to admire the sun rising from behind the peaks but, as we were unsure about the weather, we opted to stay at the inn and hope for the best. 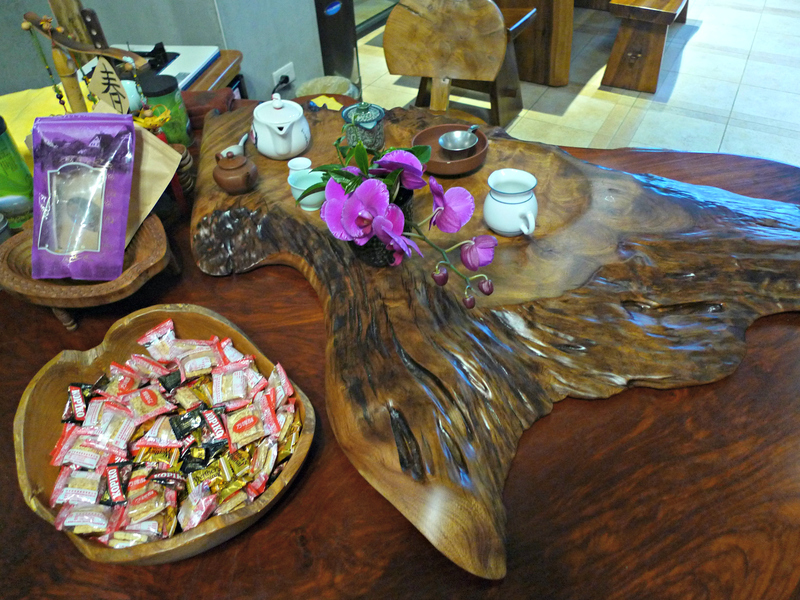 After a quick tasting of the inn-keepers’ own Oolong tea downstairs, on a magnificent wooden table, special the the mountain area, (and buying some more packets of tea!) finally, tired and with excited anticipation, we fell asleep in our comfortable beds. Between 4 and 5 am, we were woken up by excited cries from our daughter: “Come and see, the sun is rising!” The night before, none of us could have anticipated the spectacle that unfolded in front of our eyes. 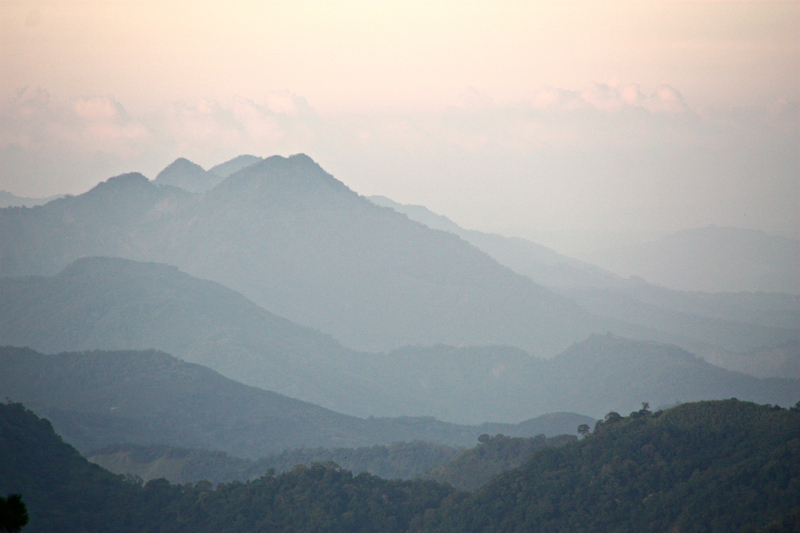 Gradually, the mountain peaks around, and the valley below started to take shape and get in focus. The colourscape kept changing until the fabulous, sharp panorama revealed itself in all its glory, in brilliant sunshine. In addition to all the visual splendour, the silence was almost deafening, especially after the bustle of busy Taiwanese cities. And all this, from the best possible vantage point, right there on our own balcony – how awesome is that! We took a short walk around the inn before breakfast, to finally get an idea we were had come to. For me, the new modern wing of the inn, where we stayed, looked a little bit out of place in that natural setting but, I must say, it served its purpose well. Tea grew all around, and the rounded rows of it could be seen through all the windows inside as well. 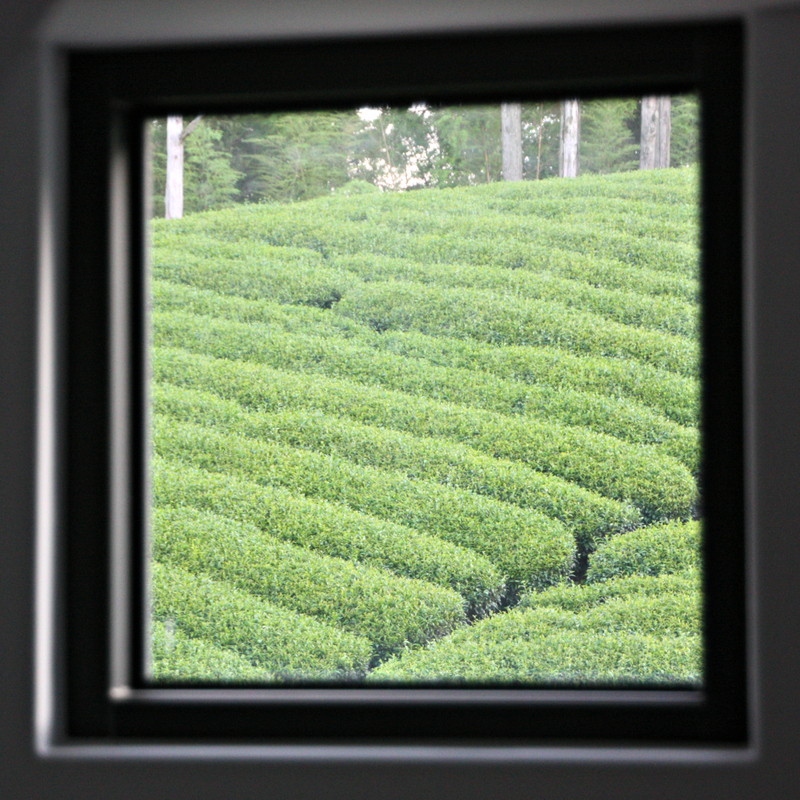 In fact, the windows were like landscape paintings, depicting the surrounding beauty of the area. 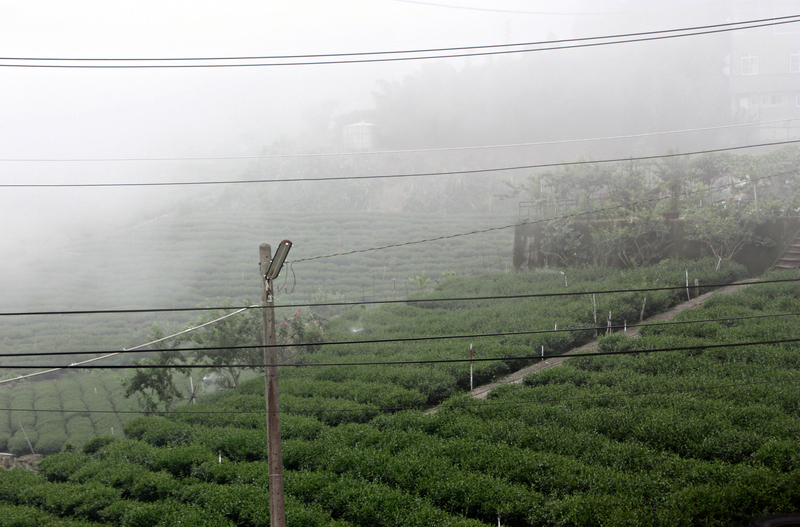 After a nice breakfast, it was time to go for walks in and around the many tea plantations. 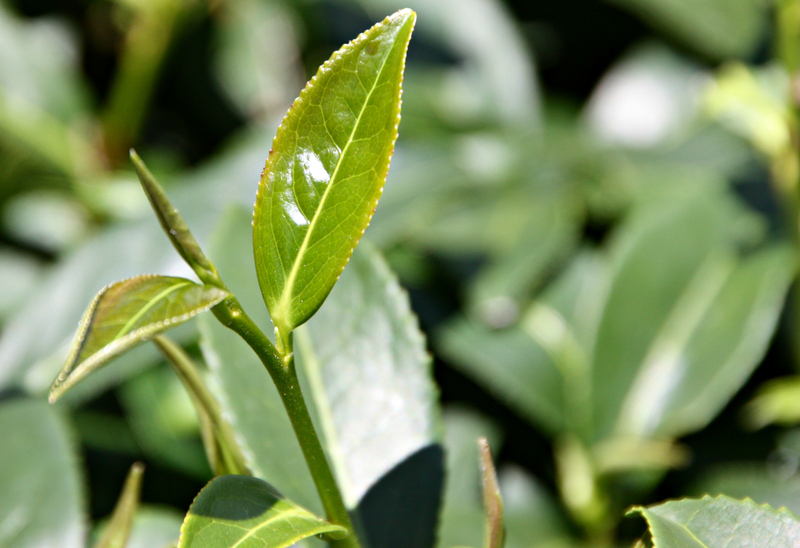 At last I had the chance to walk in between the rows of tea, touch the waxy leaves and try to get the very faint scent. It was easy to walk up and down the nice wooden stairs, provided on the slopes. 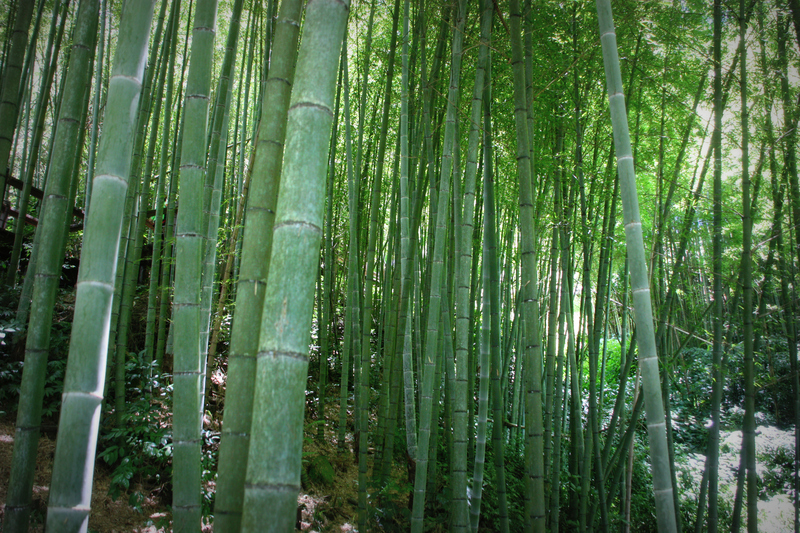 You could even go for a hike in a bamboo forest nearby. And wherever you turned, there was yet another spectacular view. We were in heaven! 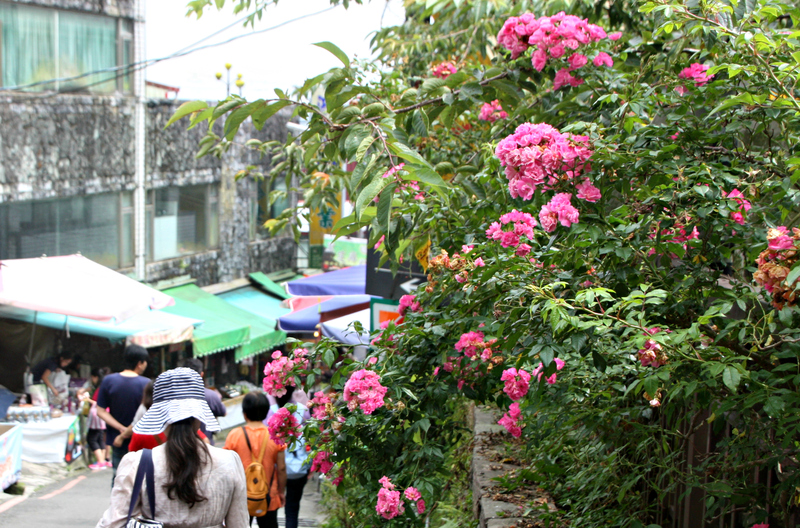 One word of warning, though, for anyone going on Alishan: the cool mountain air is very deceptive – I ended up totally burning my arms (through the silly holes of my sleeves! ), not feeling the heat of the sun in the mountain breeze. I should have seen it coming! 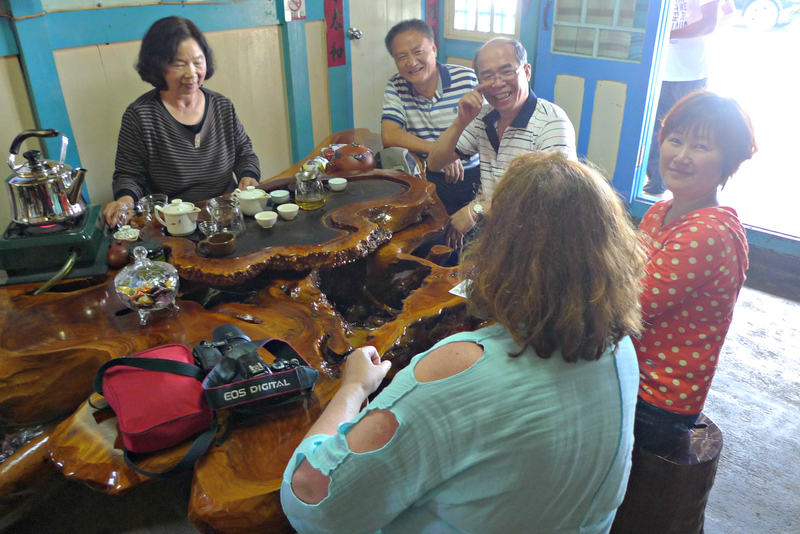 While our youngsters preferred to do several hikes, we found another tea plantation down the hill, went to have a look, and ended up having one more Oolong tasting session around a wonderfully carved wooden table. More and more people kept coming in, and eventually it looked like we had the whole family tasting tea with us. 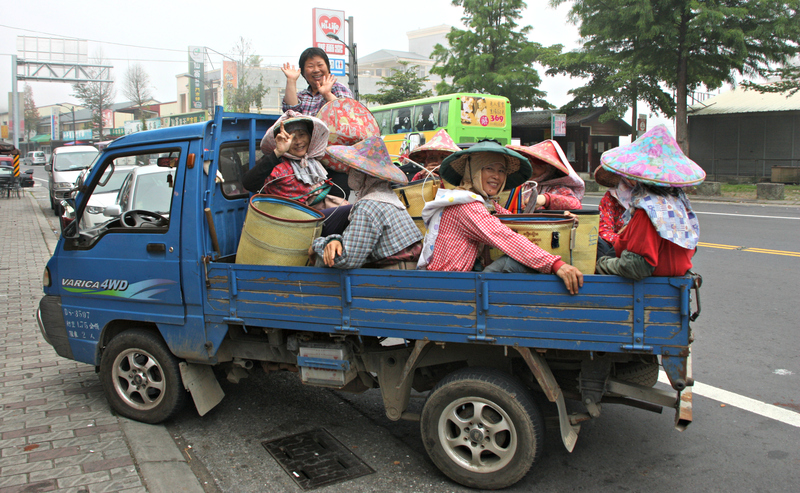 It transpired that these people were actually related to our inn owners if we understood it correctly through the few broken English words our Taiwanese hosts tried to say. No common language but still we shared a fun time together. Just the sort of impromptu meeting that we so enjoy during our travels. And off we went, with more packets of tea to take back home. 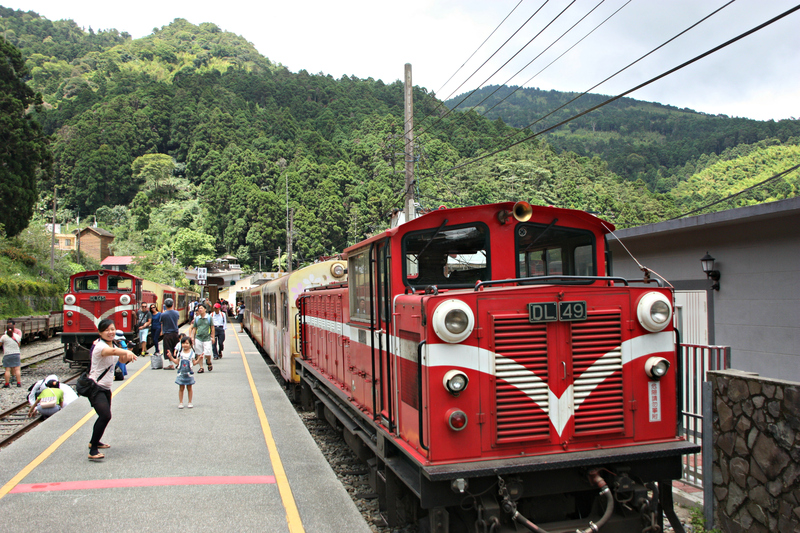 Once the only way to get up and down the mountain, the cute red engines still chug along the steep mountain sides. Unfortunately, according to Focus Taiwan, after serious typhoon damage in 2009 and more just last autumn, the whole 70 odd km stretch has still not been repaired to this day. Opened in the early 20th century for timber transportation, the railway was turned mostly touristic in the 1960s. 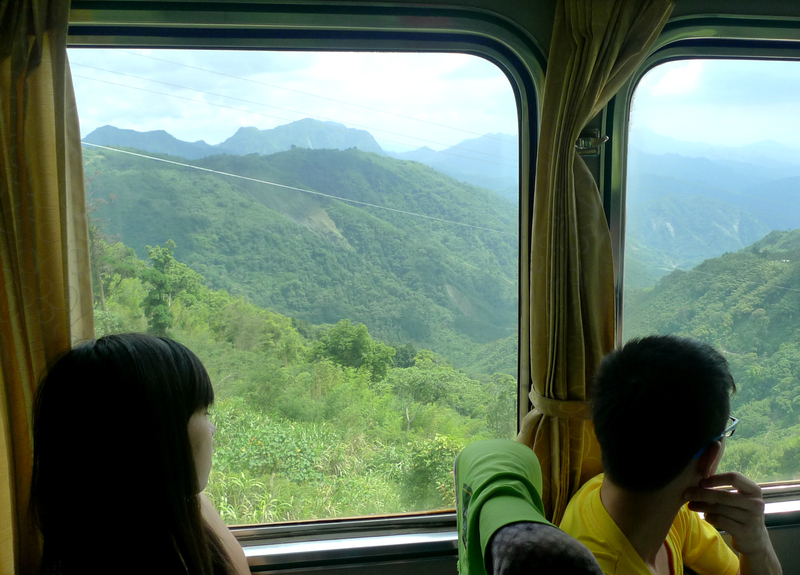 Twenty years later, in the 1980s, with the completion of the Alishan Highway, cheaper and faster buses started to take customers away from the trains. Today, it’s mostly diesel engines instead of the old steam ones but, nonetheless, it’s definitely an experience not to miss. 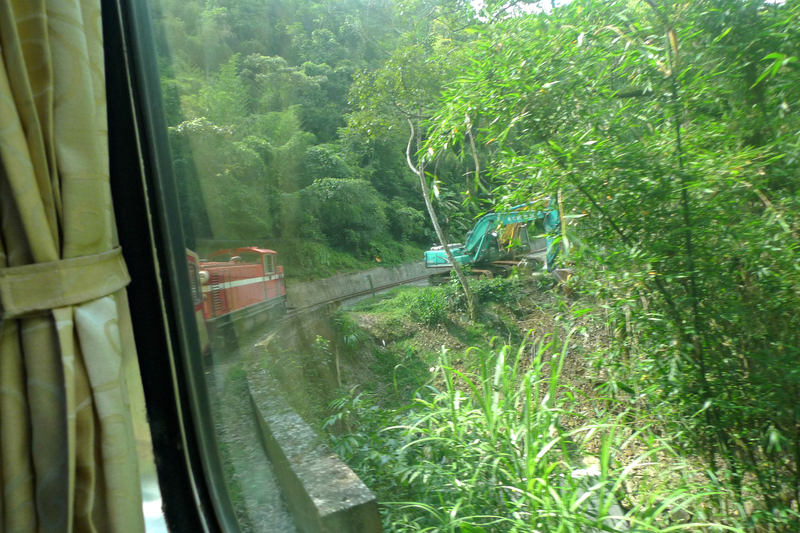 The technology required to run a train on those steep slopes is amazing! Waiting for departure on the platform, there was an elated ambience of setting off on a grand adventure – and that’s what it truly was. 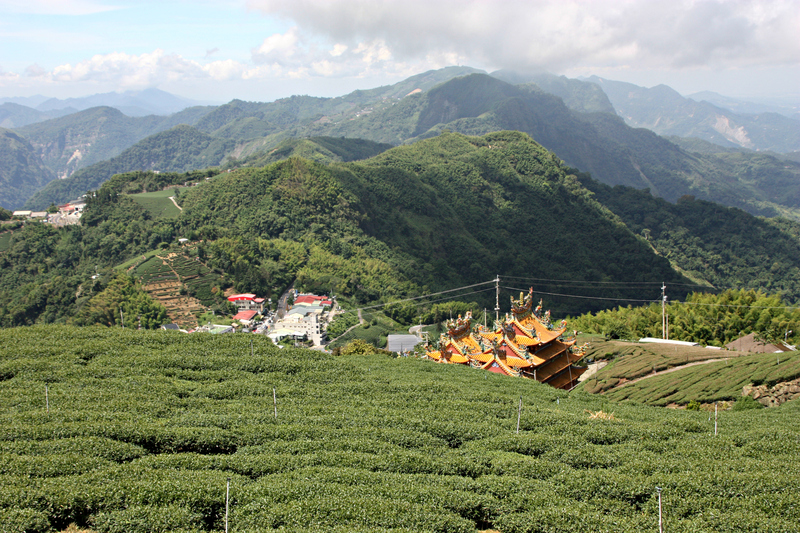 The two-hour return journey down the mountain took us through bamboo forests, and more tea plantations on the slopes, dramatic mountain scenery and unbelievably lush greenery. The tiny carriages were cosy, and I noticed that the regular clickety clack of the train made several passengers nod off at some point. 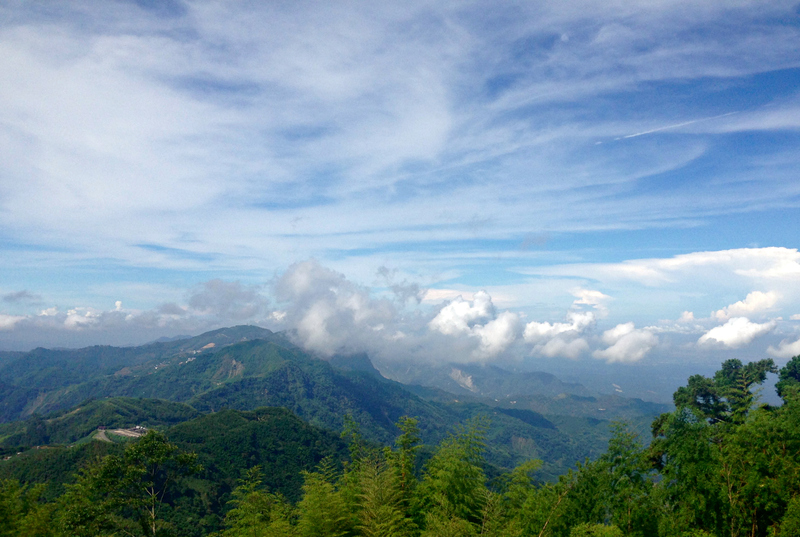 What a way to end our brief, but unforgettable, glimpse of mighty Alishan. 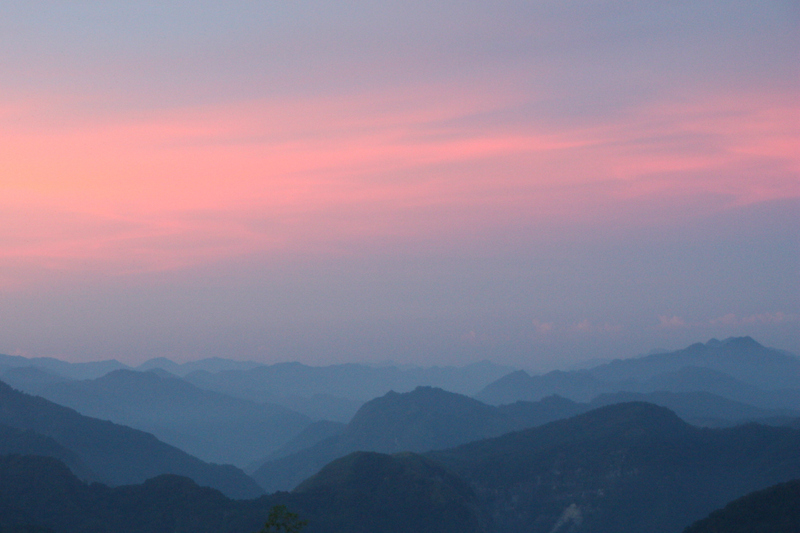 And now, a year on, I still vividly recall all these memories and sentiments, the views, the sounds and the smells, every time I’m enjoying a cup of fragrant Oolong from Alishan. 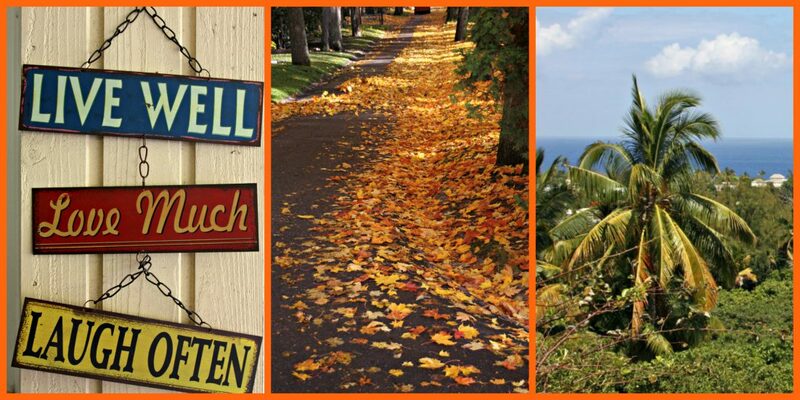 Categories: Abroad, Travelling makes me happy | Tags: Alishan, Asia, mountains, Taiwan, tea, travelling | Permalink. I learned it in my childhood home that as a family, you gather together for dinner around the kitchen table, every single day. I carried this tradition on in my small family. Around 5-6pm, we used to have home-made dinner together all through the years our only daughter was growing up. A time for exchanging the daily news, and bonding with your nearest and dearest. It’s been hard to let go of this special daily moment since our daughter moved out of the family home. Of course, I and hubby still eat together, most days, but it just isn’t quite the same any more. I think for me, dinnertime will forever evoke the presence of your family. The food can be simple or fancy, but it’s your family you’re sharing it with that really counts! For this reason, I chose a family dinner picture for this week’s Photo Challenge. It’s a picture of the last family dinner we had together. Not at home but across the world in Taiwan, where our daughter has been teaching with her boyfriend for the last two years. We visited them last summer, and as our trip coincided with my husband’s birthday, we went for a special seafood dinner to celebrate, on Quijin island, next to their home town of Kaohsiung, on the south-western coast of Taiwan. 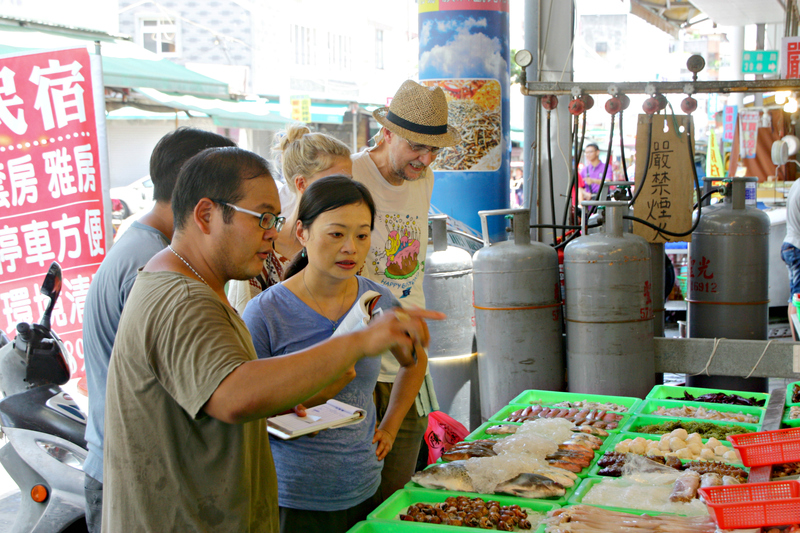 In the picture you can see the three of them enjoying the fresh, local delicacies from the Taiwan Strait waters. And by fresh, I mean REALLY fresh! 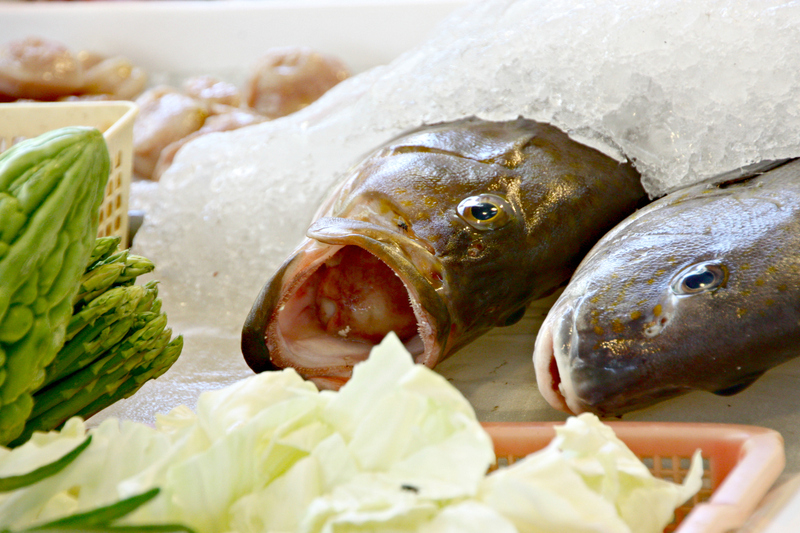 On the island, it is customary to have the restaurant at the back of the fish shop that’s outside on the pavement. 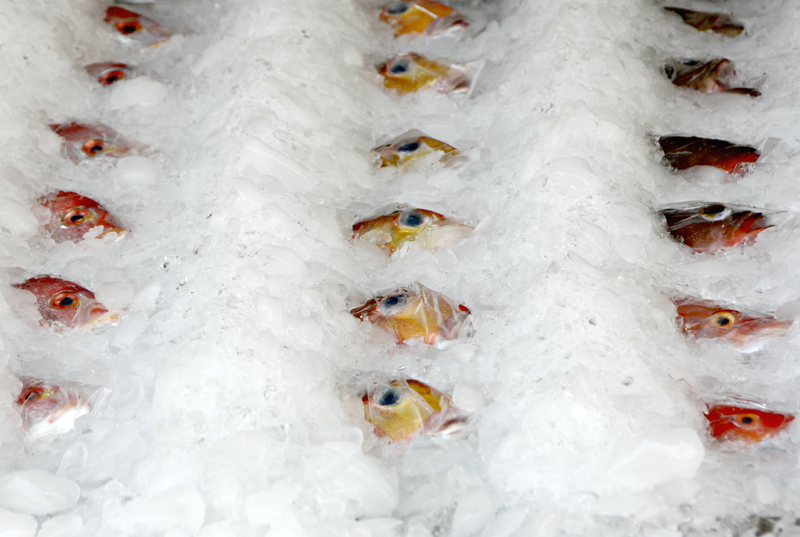 You either buy the daily catch to take home, or you choose what you want to be cooked for you on the premises. 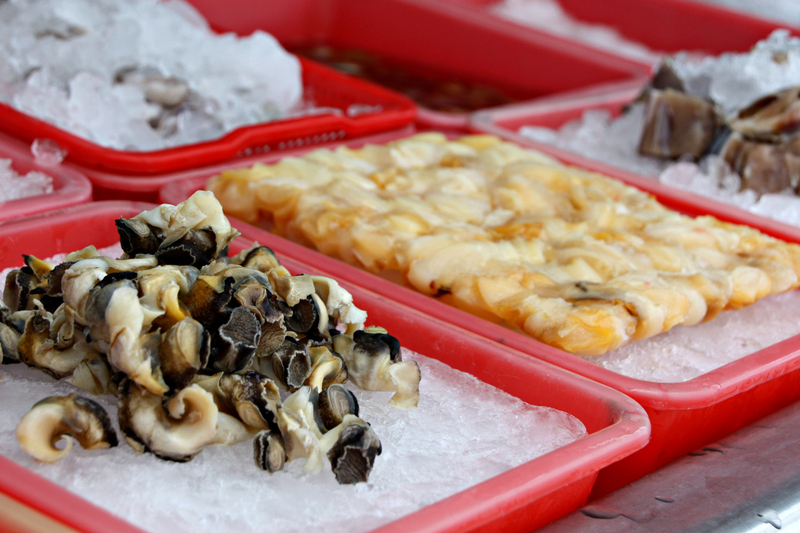 In the pictures below, you can see us making our picks outside the restaurant, and some of the produce on offer. My hubby absolutely loved this – the stranger and and more unusual the food, the happier he is. A perfect birthday dinner with family! Categories: Abroad, Life, Travelling makes me happy | Tags: Asia, dinnertime, family, photo challenge, photography, seafood, Taiwan, tradition, travelling | Permalink.